THE SCHOOL: The Chaupin School in the community of La Merced near the town of Carhuaz. 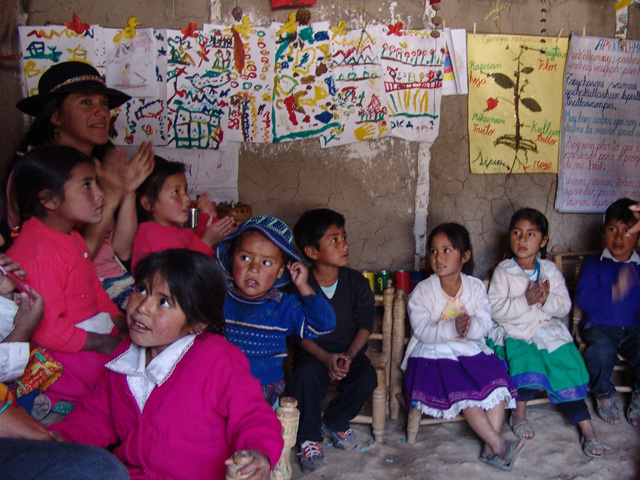 This school is an example of how rural Peru can meld ancient Quechua wisdom and its teachings, with curriculum standards set nationally there. In this way Quechua culture, tradition and identity can be preserved while the children also learn about the world in which they live. SCHOLARSHIP: The University of Huaraz located in Huaraz boasts an excellent educational opportunity for the young adults of the region. A room in Huaraz, books, transport, and tuition for 6 days of classes a week for one year costs a mere $2,400 but represents a huge obstacle to potential promising students who don’t have the means to attend. Ayni Projects is currently funding one 5 year scholarship for a professional nurse midwife student, and one 5 year University Engineering student. We are also giving scholarships to deserving youth to take courses of study in English, Culinary Arts, and Business. With the advent of our Madrina Padrino program we are supporting children in the town of Carhuaz with school fees, school materials, and an after school tutoring program for kids who are having trouble learning.